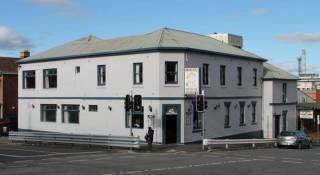 Located in central Hobart, Avalon City Retreat offers free Wi-Fi and free breakfast provisions. The 2 bedroom, 2 bathroom apartment features a hot tub and a patio deck with a lounge. Your breakfast provisions are provided in your kitchen and include fresh bread, bacon, sausages and eggs. You can enjoy dining out on the patio, which offers outdoor furniture. The apartment features a fully equipped kitchen, modern décor and BBQ facilities. The glass-fronted apartment is located on top of an 8-storey office building, overlooking Hobart city. The minibar includes a selection of pre-prepared meals available for purchase. 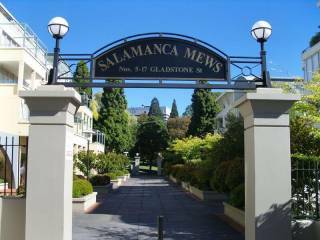 Avalon City Retreat is located 5 minutes’ walk from Salamanca Place. 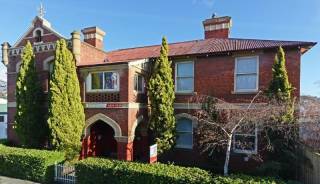 It is 7 minutes’ drive from the Royal Tasmanian Botanical Gardens. 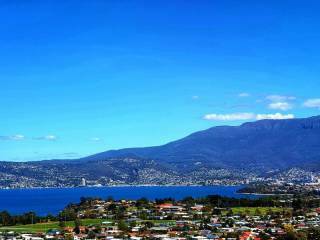 Mount Wellington is 30 minutes’ drive away. Two bedrooms sleeping up to four people, two ensuite bathrooms. Custom made king size beds (good for those of us who are burdened with the ‘princess and the pea’ syndrome – the bed is our own layer upon layer design, soft on the top and firm below). Jersey knit linen on the beds, just like sleeping in an old comfy t-shirt, we like it much better than the 1200 thread count business. Big fat squishy pillows, goose pillows, latex pillows and more pillows in the cupboard. Somewhere to plug in your phone that won’t fry your brain. Artwork from all over the place - Italy, Tasmania and Italy and yes, Italy. More stuff in the kitchen than you will ever use. Scholtes fancy gas cooktop and oven. Crockery settings for 12 – lovely plain white Steelite (Royal Doulton Commercial range). Lots of utensils and cookware, pans and serving plates. Bunnykins breakfast plates for grown up kids. Nepresso coffee machine with pod things because it tastes good and you don’t need to be a barista to make good coffee. Tea things for the refined tea drinkers. Complimentary Provisions in the kitchen like tea, coffee, sugar, milk, bread, flour, biscuits, rice, herbs, salt, pepper, oil, vinegar, glad wrap, foil, baking paper – you know, the stuff you need. A minibar of wines, beer and malt mostly from Tassie but things like Shiraz – well we are just getting started – so the best of Tasmanian wine is here but it is hard to beat a Barossa or Hunter Shiraz. A very special dessert – that is all I am going to say – well apart from – go to town on the amazing choice of Hobart restaurants but come ‘home’ for dessert. It is a French interpretation with a Tasmanian twist. This dessert exists to make you feel happy – our gift to you. A 3.3 M long Huon pine table that seats 10 – made by artisan Stuart Houghton. Stuart knows timber. A comfy feet up leather Arthur G couch. TV – it isn’t big because we are not bogans nor do we have enough money to buy the B & O extravaganza. Musac via Sonos via the Retreat Ipad. Movies via Itunes via Apple TV. A collection of books about design, architecture and Tasmania. Bbq with a hood for slow roasting. Outside table, designed by Craig Rosevear and made by the sons of Cordwell Lane. Illuminated moon lounge we imported from Spain. Beautiful Huon pine outdoor bath. Ever changing colours in the park. Combo washing machine and dryer. Breakfast provisions including eggs, bacon, tomatoes, sausages, muesli, yogurt, fruit, and juice. Binoculars for checking out all the action. Some things to draw with if you find yourself in a creative mood. Smiling host to check you in. Entry is via a lift to the 7th floor and then 24 stairs to the rooftop (so if you have mobility issues it isn’t going to work for you). We are good for you to have a maximum of four people sleeping in the retreat. We are also happy if you want to invite up to an extra six people for a drink, dinner or lunch, just let our host know this is what you are planning. We are also good if you want to invite more folks to enjoy your ‘penthouse’. We charge a function fee for larger groups, so go to the functions page on our website or call us for all the details. Comprehensive compendium with everything you need to know and a lot of stuff you don’t. We can organize an in-house chef - but we need a bit of notice for this one. We can organize spa treatments with Jes. There are two push bikes in the car park for guests' use – they are not the road racing type, more your Italian village, go buy the bread and vegies, basket, bell type. Bike helmets and a bike pump are provided. There are fluffy towels in the ensuites, hair dryers and those bake your hair tong things. Proper toiletries of all description. Other things in the mini bar you may need like condoms, our custom bed or an Omnipod. An iron and ironing board if you have to iron. There are lots of other things but you can have fun finding them when you get to go through all the cupboards. Avalon City Retreat is an oasis in the heart of beautiful Hobart, Tasmania. The Penthouse apartment sits atop a 1963 Dirk Bolt designed office building with arguably the best grandstand views over St David’s Park, Salamanca, Sullivans Cove and the wandering river beyond. The city location provides easy access to the waterfront, ferry to MONA, the seaplane, Salamanca restaurants and the CBD. The Retreat is a luxury, modular designed ‘Omnipod’ that is cantilevered off each end of the office tower – a spectacular sight. There are two bedrooms with king size custom made beds with deluxe linen and cashmere throws. Each bedroom has its own ensuite bathroom. The unique minimalist form houses the personally curated, elegant and eclectic interiors. The fully equipped kitchen with everything you will need to cook up a storm, including Scholtes cooking appliances is a delight to occupy. Or if you are in the mood for some special room service, Rocky from the Astor Grill will deliver your dinner right to the hotel rooftop. There is a 3.3 m artisan Huon Pine dining table with generous room for ten. Outside on the evening deck you can cook a barbeque, rest on the illuminated moon lounge or enjoy some wet stargazing from the outdoor craftsman built Huon pine bath. Tasmania is a place of many contrasts and contradictions. One of the amazing things about this island is the astonishing ever changing light that seeps deep into your being. The Retreat sits just off the bird highway so you watch the circulation of activity on the roads, parks and river and in the sky. This soothing sanctuary is built for sharing, quiet noise, celebrations, contemplating, dreaming, cuddling and fun. Avalon City Retreat is a sea of calm, an oasis, a memorable escape from the ‘circus’.